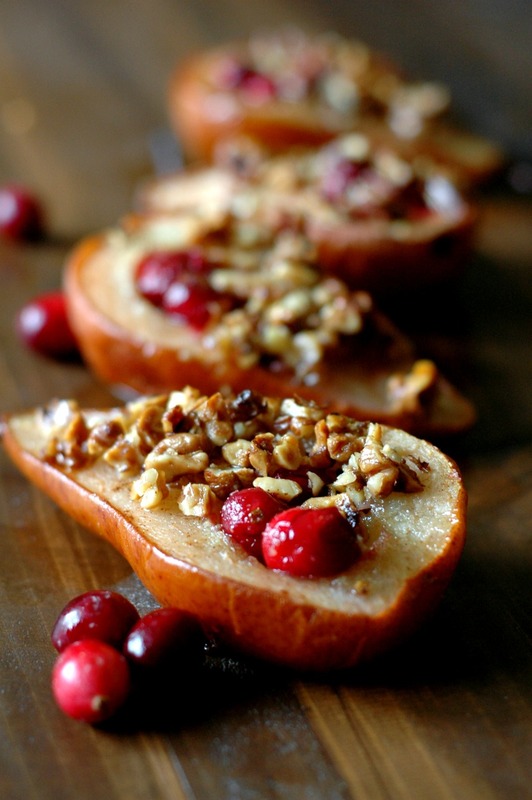 Festive cranberry baked pears are the perfect kid pleasing yet healthy treat for the holidays! I have always enjoyed the holiday season, but every December that has rolled around since having kids in the house, things just feel a little more magical. The first snowfall, Christmas jammies, the childlike awe over lighting up a tree, and the anticipation of Christmas Day….it’s enough to make you feel like a kid again yourself, and it has been so good for me to see Christmas through the eyes of little kids again! 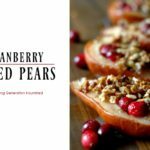 Cranberry baked pears have become one of those Christmas traditions that our kids have grown to excitedly anticipate each year! When it’s hard to settle in on Christmas Eve in anticipation for the next day’s events, making baked pears has become something to give the girls something hands on to do to “hold them over” while they wait for the fun day to come! The beauty is in the simple prep! One of the biggest reasons I started making baked pears on Christmas Eve was because it was something the kids could do almost 100% on their own! When you have so many other things going on such as family gatherings, or Christmas Eve services, or your own family traditions, it is nice to have a simple kitchen project that won’t make a huge mess, and that won’t take up a lot of time. Line the kids up assembly line style and let them do it all themselves! Serve them up on special plates, flip that Christmas movie on, and let them enjoy a special tradition they will look forward to every year. 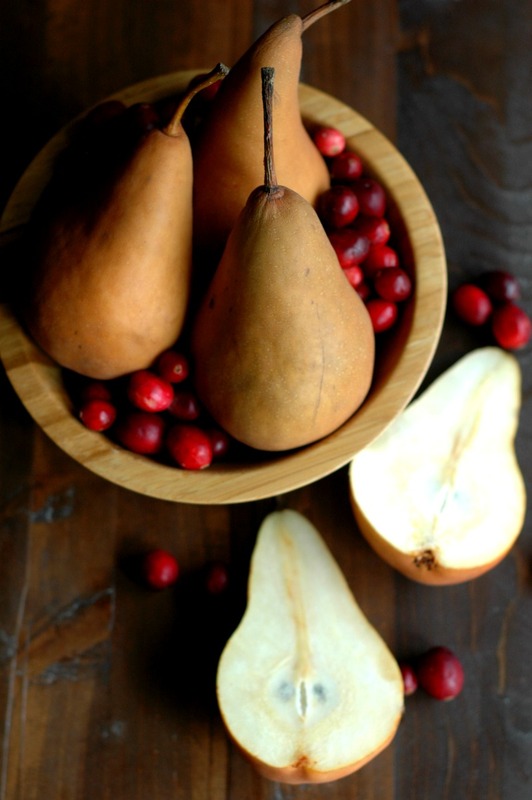 Simple and delicious, cranberry baked pears are also healthy! Because who wants their kids hopped up on a bunch of sugar before bed anyway?! My husband and I love spending the evening on Christmas Eve wrapping presents together with glasses of wine and a movie! Baking the pears brings out an amazing burst of sweetness to the fruit, and pairing it with a fat like butter coated nuts keeps blood sugars happy. So while it feels like an indulgent treat, it won’t send blood sugars out of control right before bed. 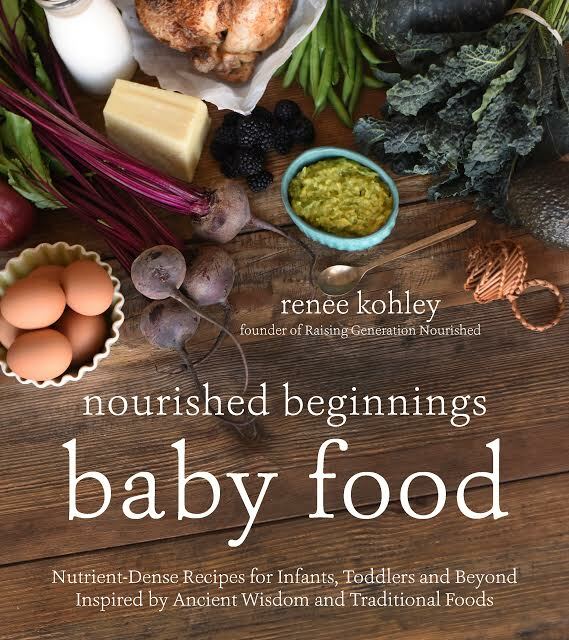 A quick note for my nut free friends and those with older babies! If you are nut free, you can use crushed seeds, or a mix of seeds and coconut shreds, or simply leave that part out! A seed based granola would work well here too. You can still drizzle some melted butter over the pears for a little fat. One Christmas I had a 9 month old in the house that wasn’t consuming nuts yet and she gobbled hers right up without the nuts. If you have babies you can leave the cranberries and honey out and just serve them a baked pear drizzled in butter – they’ll be in heaven! 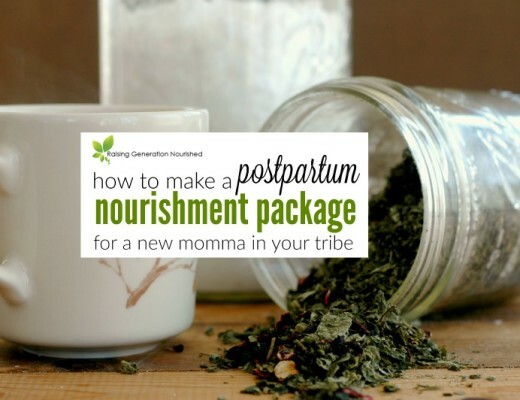 I hope to hear from you if you give this tradition a try with your little ones! You can tag me on Instagram or Facebook – I’d love to see those sweet faces with their special pretty treats! Fill the middle of each pear half with cranberries (you'll get 3 or 4 in there depending on the size of the cranberries and the "bowl" you shaped). Drizzle raw honey over the cranberries to fill the bowl in. You can fit about a teaspoon in each half for older kids and back off on the amount if you have really little ones with sensitive taste palates yet. The cranberries are really tart so the honey is needed - you can leave the cranberries out for the really little ones around 1 year old and just do the baked pears without any honey! My babies loved it! 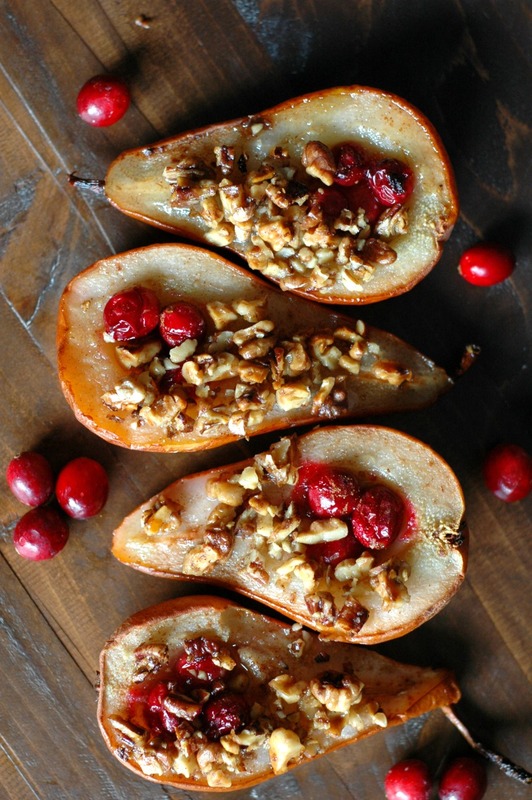 Mix the melted butter and chopped nuts together in a small bowl, and the sprinkle over the tops of the pears. Finish with a sprinkling of cinnamon to your taste. 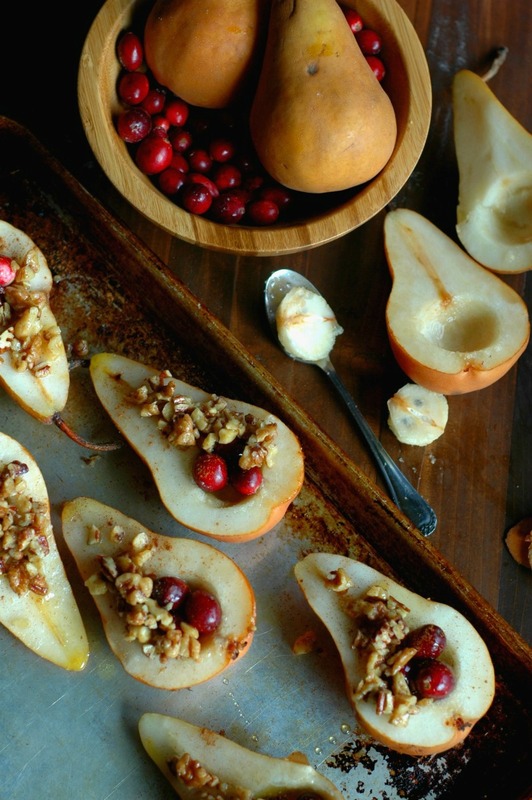 Bake the pears at 375 degrees for 20-25 minutes until the pears and cranberries are soft and the nuts are crispy. These are beautiful Renee!!! Love this festive treat! My son loves pears and I know he would go crazy over this! Little kids do love pears! Enjoy them! These look so delicious and are so pretty as well! I love them! Oh girl, these look delicious and so simple to make! These are gorgeous and your pictures are perfection! Love how your pan almost looks blue. Do these ever look good! I love that they’re beautiful, look delicious, and are simple to prepare! I’d like to try them this Christmas! Oh, my, these look heavenly! Can’t wait to try! Not only are these made with healthy ingredients, they are so festive and gorgeous as well! 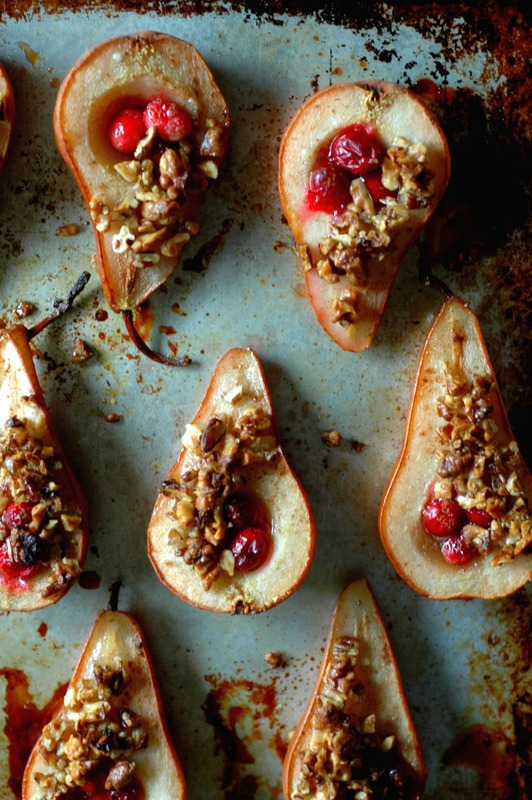 I haven’t made baked pears in forever but you are making me crave them! What a gorgeous festive treat! I love how healthy it is and nice and light, perfect after over indulging on Christmas Day! They are the perfect healthy dessert for every Occassion. I love baked pears. Just fabulous! The perfect holiday treat! My kids will love making these with me. These pictures are gorgeous, too! 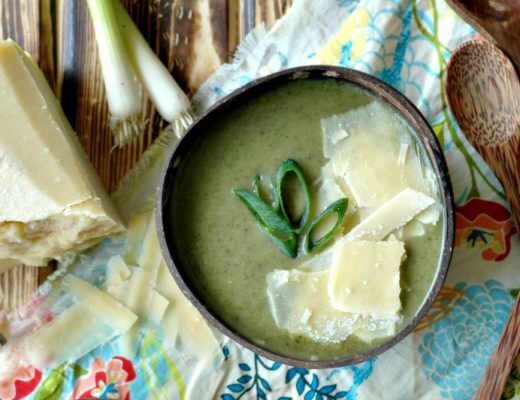 What a beautiful, rustic treat! 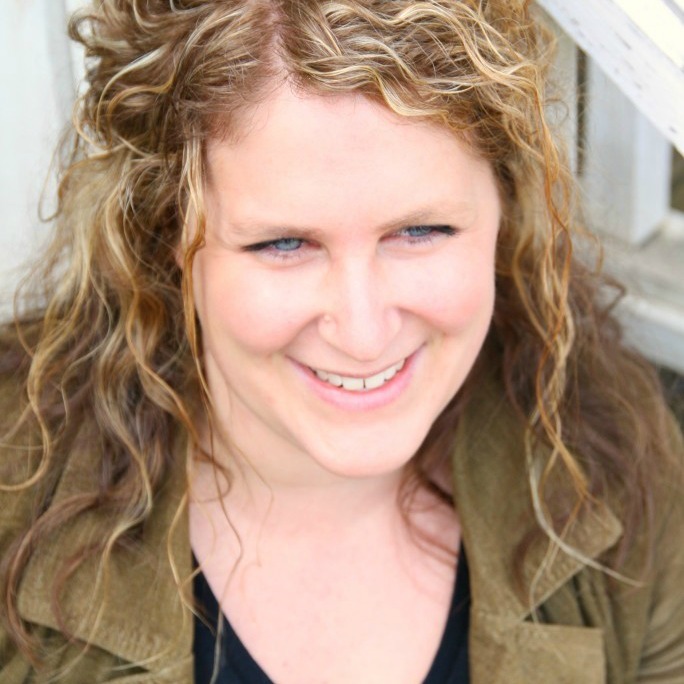 These are so special, Renee! I love baked pears! 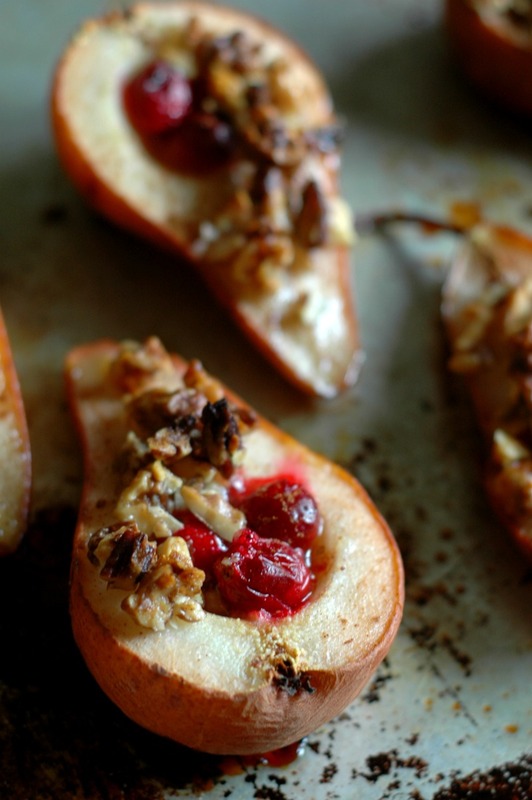 The added cranberries, honey, and nuts must make these taste delectable.